words to live by with muay thai. let me explain. 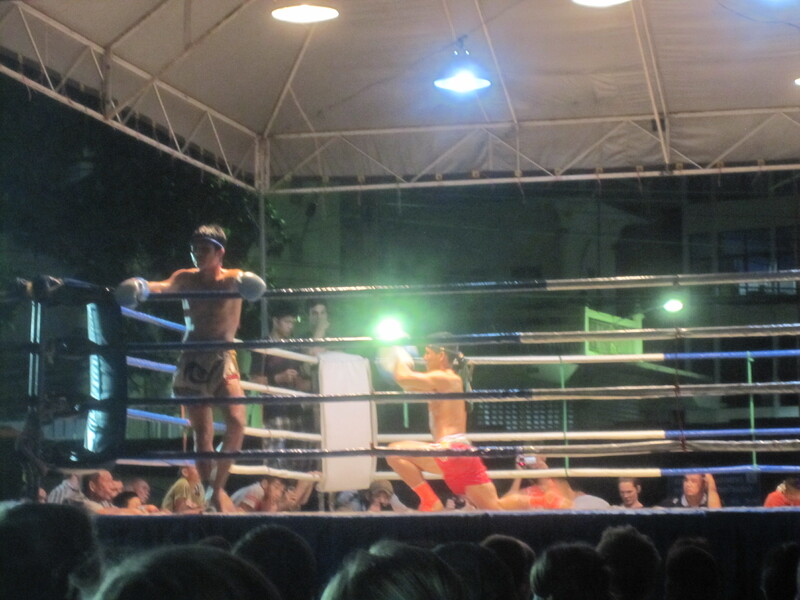 one of the top things brian wanted to do in thailand was see a muay thai (thai boxing) fight. after checking out a few stadiums we thought kawila stadium in chiang mai seemed like a good place to try because it was where the locals frequented to watch the fights. we saw there were two other stadiums that hosted fights, but they seemed a bit touristy and we were pretty pumped up to visit this one. the first night we tried to get to kawila the tuk tuk driver started taking us to taphae stadium which was the super touristy one. we specifically kept saying, “no, no, we want kawila!” and he kept replying, “no, no kawila, taphae fight tonight.” 40B ($1.30) later we unsuccessfully got out of his tuk tuk, disappointed that we couldn’t find kawila. we quickly found out that kawila did not have fights that night but they did the following nights. the next night we get into a tuk tuk and we ask for kawila stadium the driver says, “no, no, kalare stadium tonight.” kalare was the other stadium featured, but not the “local” one. we thought that due to being tourists we were getting the run around and encouraged to go to the touristy spots so we kept persisting. after a few more requests and a few more confused responses from tuk tuk drivers, we finally found a guy who was willing to take us to kawila stadium. not quite. we get to the supposed stadium and it is completely deserted, dark, and had a rickety door with a dry erase sign that said “kawila” hanging on it’s side. after opening the door to the stadium, we quickly realized that it was no longer there. turns out it had been burned down in a fire this past year, so they were re-routing all of the fights. ahh, finally made sense on why everyone was saying “no kawila.” although quite disappointed with what we figured out, at least we now knew. 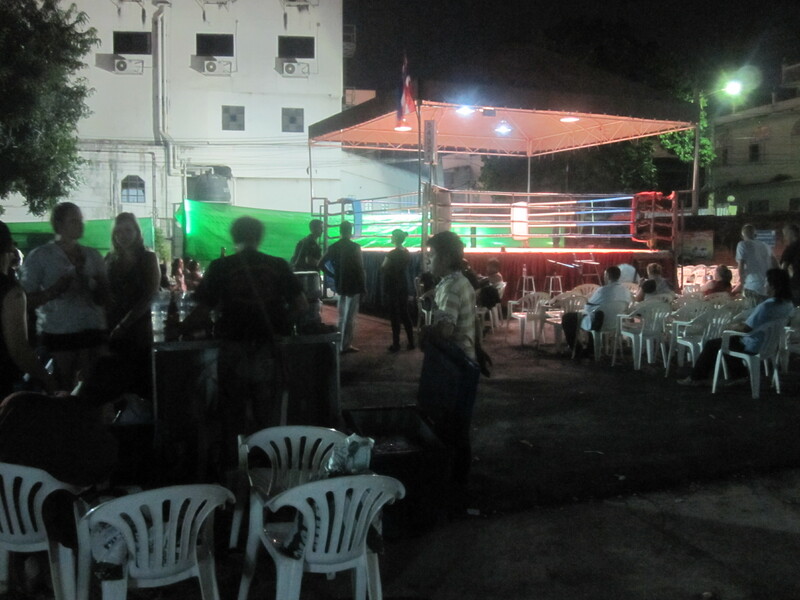 a guy we met said that all the kawila fights were now hosted at kalare stadium and definitely worth checking out, so that is what we did and we had a great time. thanks to brian’s play by play commentary of each fight, i now know a little strategy on muay thai. we saw kids, women, men, and heavy weights box and it was just as entertaining as i hoped it would be. it was crazy, the fighters were right behind us the whole time so you were right in the mix of spectators and athletes. best seats in the house are towards the back. so cool! OK, I learned something new today! Never heard of this type of fighting, but it sounds like a cool, very Thai event! It was neat that you could go where the locals go, nice to not be with tourists!